Viadux is passionate about innovation and bringing the world’s best products to Australian customers. It’s all part of our goal of being the most progressive and responsive supplier of water network solutions. Developed by PAM, the worlds leading manufacturer of DI Pipe, Zinalium® is a highly effective, patented alloy comprising of 85% zinc and 15% aluminium. This factory applied, ACTIVE corrosion protection system, will extend the service life of your pipeline and reduce on-site handling by eliminating the requirement for polyethylene sleeving. The entire outer surface of the ductile iron pipe is coated in an 85% zinc and 15% aluminium alloy at a density of 400g per m2. This hot metal spray is applied directly onto the ductile iron providing active galvanic protection. 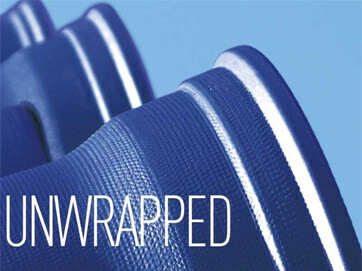 Extensive research in the installation of loose polyethylene sleeving reveals that it takes up to 15 minutes per length of pipe to install. This accumulated time can account for up to 5% of the cost of a pipeline, tying up personnel and machinery. By eliminating the need for sleeving, the installation of Ductile Iron Pipe becomes a simple one step push fit operation. Not only will contractors find a typical ~5% cost saving in time, but also further saving in the cost of the sleeving itself which makes up to 2% of the cost of Ductile Iron Pipe as a complete system. The end result is a cost effective solution which will increase installation efficiency and asset life. 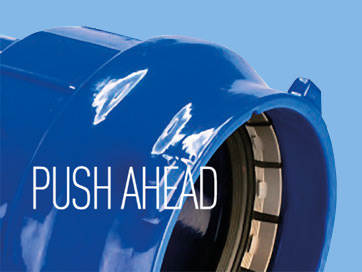 The IZIFIT range of ductile iron couplings is an innovation from Saint-Gobain PAM. 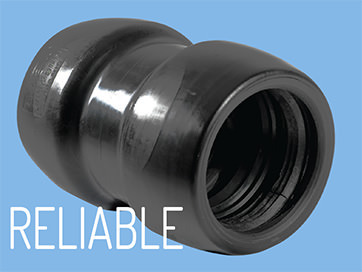 This unique range of universal fittings suits both HDPE and Blutop® ductile iron pipe systems transporting potable water under pressure. Pipes can be restrained or unrestrained simply by insertion of an anchor gasket, which features stainless steel inserts, or a non-anchor gasket. The seals and the restraining system were designed in France by Saint-Gobain PAM. A new coupler for poly pipes up to SDR11 PN16 with a double lip seal and specially designed grip ring. Simple, quick, reliable, with Plug&Play® you avoid welding, no need for glues, no wrench tightening. Plug&Play® is ideal for repairs and city work sites or impervious areas.